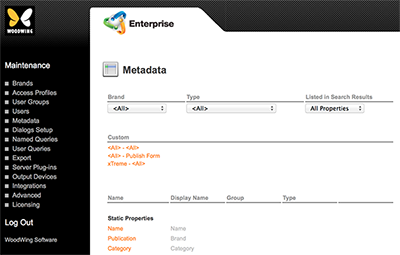 Each metadata property in Enterprise Server has a name by which the property is known in the system as well as a display name that is used for showing the property in the user interface of the client applications that connect to Enterprise Server. Example: The property named 'Creator' is shown to the user as 'Created By'. Sometimes this default display name needs to be changed to a different name, for example to make it match the name in a related workflow. Example: When working with content that is going to be published to Adobe DPS, the Enterprise property 'Keywords' can be renamed to 'Tags' so that it matches the name used by Adobe for this property. This way, users will have a better idea of the type of information that needs to be entered in that field. In Enterprise Server, choose Metadata in the Maintenance menu on the left side of the screen or on the Home page. Step 2. Click the name of a property for which you want to change the display name. Step 3. In the Display Name field, enter the name that you want to use. You are returned to the Metadata page. Note: Properties for which the display name has been changed show the display name in black text instead of the gray text used for default display names.